Since I last blogged we have been out in Colorado, climbing as much as possible! We have been staying in Boulder and I really like it as a town; good climbing scene, nice people, good coffee! And, of course, in one direction you have Rocky Mountain National Park and in the other, Mount Evans, Guanella Pass and Lincoln Lake. Not bad. The only negative thing I can find is the amount of driving, the park is the closest of those listed and takes an hour to get to at least. But that is nothing really and we get laughed at for thinking that is long, us English are just not used to long drives American style! I’m not sure where to start…we have had lots of great days out. There are lots of boulders I am psyched to climb here but I guess I will talk about the ones I just managed and hopefully I will have the opportunity to do the ones I have not yet managed soon! I will start with Guanella Pass. We arranged to go a week or so ago with Angie as she had tried a problem there and wanted to go back for it. The area is just past Mount Evans and is right by the road (a nice break from the long walks!). It isn’t a very big area but it has some good problems. Angie was trying Mind Matters, a V12 that goes up the centre of a big boulder. The problem centres around a hard move from a bad pinch and makes for great climbing. David, Shauna and I tried the moves on the problem and were all very keen to try it again. Angie sent it that day, very impressive to watch especially because it was a very hot day. We went back a week later (in the evening for the colder temps) and all three of us managed to climb it! Mine was very much a “one more go” moment when I was really tired so I was especailly surprised and happy to find myself on top of thr boulder. Mind Matters V12, Guanella Pass from mina leslie-wujastyk on Vimeo. One rest day and then we headed back to Lincoln Lake. I had two problems I wanted to do this day, both I had tried before and was keen to finish. The first, Phobos is an overhanging V10 with big moves – not usually my forte….but really fun climbing! On my first session I had been falling off the last hard section so I was positive and hoped that it would go down fairly quickly. It was not to be so. I had a real fight lined up! I dropped the end section multiple times, I even got past the hard climbing once and my foot popped on the easier mantle section. It was going to be a battle. I had a 30 minute rest and then had another go. Fell again. One more try and I was finally topping out! I was so exhausted by this point (bear in mind all this is going on at an elevation of 12,000 ish ft). I watched other people for a while and rested, gearing up to try Unshackled, my second aim for the day. I was pretty tired by the time we got to the boulder and it was getting pretty dark. 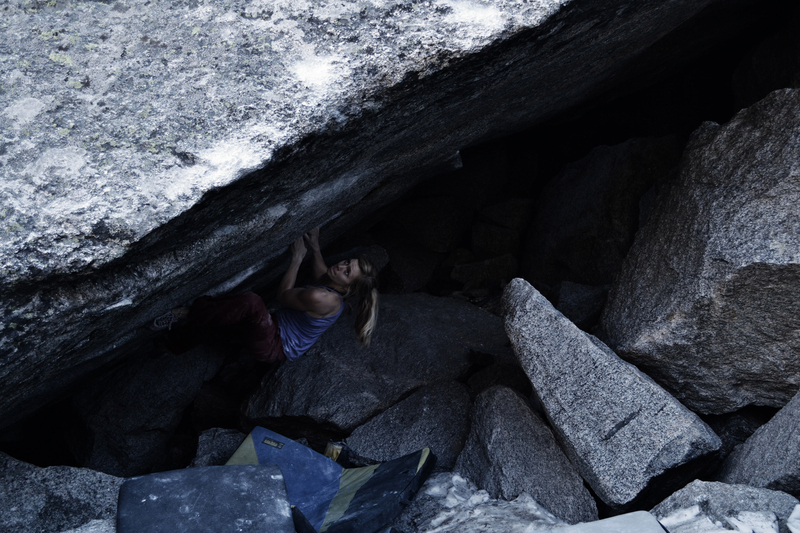 Unshackled is a V9/10 which follows a crackline through a steep roof. I had tried it before and got very close but I was very tired now and didn’t have another Phobos-esque fight left in me. I didn’t warm up again, I just pulled on and had a go. I tried hard and somehow ended up on top. My fingers went numb at the end and I had horrible hot aches after but I was happy to have done it and not to have another epic. All that was left was the walk out…. Little Days Out, A Summer in Colorado: Part 2 from mina leslie-wujastyk on Vimeo. Little Days Out, A Summer in Colorado: Part 1 from mina leslie-wujastyk on Vimeo. You climb is awsome Mina, I havent climbed due to illnes for 15 years, Little Days out is great and I realised that I only did one sport climb in my past, just to try it, it was either the mightier or mightiest at Ansteys Cove (the Mitre Area) and really enjoyed it.